NERO is pleased to announce ART CONVERSATIONS, a new series of live streaming talks in collaboration with Palazzo Grassi. The first of six meetings will take place this Thursday at 6:00pm and feature French artist Philippe Parreno (Oran, 1964) and Carlos Basualdo, curator at the Philadelphia Museum of Art. The conversation will be streamed live exclusively on NERO’s website at this link. 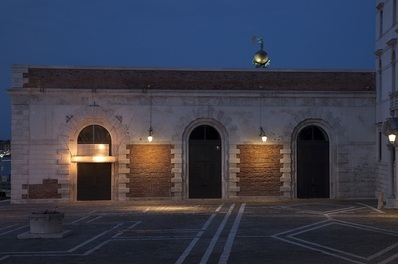 Philippe Parreno’s artistic practice is characterized by his strong collaboration with other artists – which often led him to produce works for four hands – and called for the exploration of different artistic and creative disciplines. Since the 1990s, Parreno has given life, together with Pierre Huyghe, Douglas Gordon and Dominique Gonzalez-Foerster, to a radical rethinking of the concept of exhibition. He considers an exhibition as a temporal space where multiple points of view on art and creation are offered, which allows for links to be created between the various forms that an artwork may present. Following this logic, Parreno has collaborated in staging the exhibition “Dancing around the Bride ” (2012 /13), curated by Carlos Basualdo at the Philadelphia Museum, creating an exceptional set design to exhibit the influence of Marcel Duchamp on four American artists of the postwar period: John Cage, Merce Cunningham, Jasper Johns and Robert Rauschenberg. Parreno’s installations and films feed on references ranging from science fiction to radio, the Internet to philosophy, from fairy tales to the occult sciences. 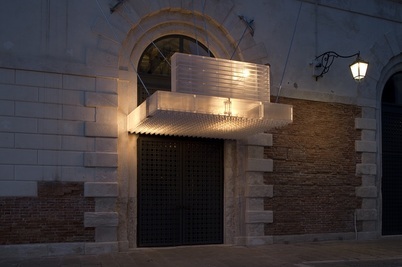 His work Marquee (2013), a site-specific installation presented at the Punta della Dogana in occasion of the exhibition “Prima Materia,” hangs above the entrance of the museum. It is part of a series of interventions already taken at the entrance to many museums – including the Guggenheim in New York, Kunsthalle in Zurich or, more recently, the Palais de Tokyo in Paris – and presents dreamlike and ironic evocations of the importance acquired by the spectacular element in the world of contemporary art. Marquee is a work that plays on the register of immateriality, developing an almost unreal aura. ￼Philippe Parreno’s works were recently presented at the Palais de Tokyo, Paris (2013), where he was the first artist to have carte blanche to occupy the entire space of the museum; at the Garage Center for Contemporary Culture, Moscow (2013 ) at the Barbican Gallery, London (2013); the Fondation Beyeler, Basel (2012); the Philadelphia Museum of Art (2012); the Serpentine Gallery, London (2010-2011). Carlos Basualdo is the Keith L. and Katherine Sachs Curator of Contemporary Art at the Philadelphia Museum of Art, and former Curator at MAXXI, Rome. He was the lead organizer of “Bruce Nauman: Topological Gardens,” which represented the United States at the 2007 Venice Biennale, where it was awarded the Golden Lion for Best National Participation. He was formerly Chief Curator of Exhibitions at the Wexner Center for the Arts (2000–02), and has written extensively for scholarly journals and arts publications.